Disclosure: Please note that links to merchants mentioned within this post might be using an affiliate link which means that - at zero cost to you - we might earn a commission if you buy something through that affiliate link. Whether you're building your first website or migrating an existing one, this guide will help you decide on the best web hosting to get your website live. Over the past four years, we've analyzed 53 web hosts – measuring everything from their uptime and page speed, to the time it takes their tech support to answer the phone. Disclosure: Please note that links to merchants mentioned within this post might be using an affiliate link which means that - at zero cost to you - I might earn a commission if you buy something through that affiliate link. Bluehost The BestFast Professional Website Hosting. InMotion Web Hosting, VPS and Dedicated Hosting. GreenGeeks®: Web Hosting That’s Powerful & Eco-Friendly. DreamHost Award Winning Web Hosting. WP Engine WordPress Hosting, Perfected. Media Temple Web Hosting Reliable Hosting Services. Liquid Web Build Something Brilliant. We’ll Handle the Hosting. Pagely Managed WordPress Hosting Services. What category best describes your website? What should I look for in a web hosting company? 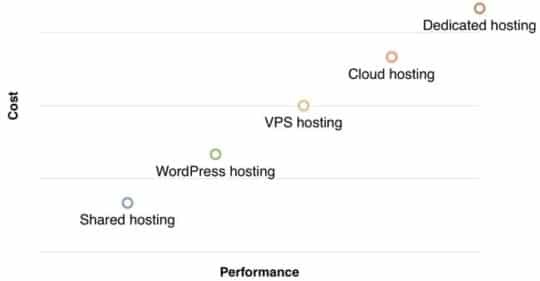 Since first publishing this guide over four years ago, we’ve analysed 53 web hosting companies using a range of metrics. Only a handful made it through our stringent testing process, which I’ve shared below. We manually tested all of the web hosts that made it through to our final cut by calling up their customer support and hosting test websites with them to continuously monitor their uptime, page speed, and ease of use. In the following guide, you’ll learn exactly what we look for in a web host. I’ll then explain what web hosting actually is, and what the different types of hosting mean, so that you know which web hosting plan is going to be the best for your website. First, here’s the 7-step process we used to whittle 53 web hosting companies down to 10 of the very best. First, we eliminated all web hosting companies that were less than three years old or had a negative reputation based on verified online reviews. If a web hosting company hasn’t been around for very long, they’re riskier. You don’t want a web host that could go out of business tomorrow, or be acquired by a web hosting company that moves your website onto their lower-quality hardware (yep, that’s happened to us before…). Out of our original list of 53 web hosts, only 27 of them passed this basic test. With over 1.9 million customers, Bluehost are one of the most popular web hosts in the world. They’re also the only web hosting company recommended by WordPress which, according to a W3tech study, is used by over 26% of all websites on the entire Internet. Founded over 13 years ago, Bluehost is regarded as the best web hosting company for beginners and small businesses. As a customer, I can vouch for the fact that they offer a great service at a very affordable price. If you’re a beginner, you’ll want a web host that you can bug the heck out of. Even if you’re experienced with web hosting, it pays to have a host with a helpful technical support team that can solve any issues you run into. While 22 of the 27 on our shortlist had 24/7 support, we decided to call up all of the top web hosting companies that made it through to our final cut, to see how long we were kept on hold – and whether the support teams were helpful or not. The times below are the average times it took for us to speak to a human after dialling their technical support phone numbers at various times in a week. For consistency, all of the calls were made within ~30 minutes of each other. Averages are based on three phone calls to each web host. Pagely – Our chat messages were responded to in 41 seconds, on average. All of the web hosts in our top ten go above and beyond with 24/7 support, short hold times, and genuinely helpful technical support. In particular, we found WP Engine and InMotion to have the best and most responsive technical support. Several years ago, I was helping a client migrate their website over to WP Engine, as they’d recently started using WordPress and wanted a hosting solution that was optimised for WordPress. Not only was moving the site to WP Engine one of the easiest migrations I’ve ever seen, but WP Engine’s support were incredible. To ensure that WP Engine hadn’t become complacent, I phoned up their support several times and asked questions about a test account I’d created. Every time I called I was speaking with a friendly technician within less than 2 minutes. Out of all the hosts I’ve ever used or tested, WP Engine is above and beyond the rest when it comes to customer support. You should be able to log in, click a few buttons, and have a live website that you can customise to bring your idea to life. We ruled out all web hosts that were unintuitive to use, or that did not offer one-click installations of popular website building tools, like WordPress. Two years ago I created a walkthrough video on how to create a website in under 4 minutes. The web host I chose to do this was Bluehost, as their one-click website setup makes it extremely quick and easy to get a website up and running with no coding or design expertise. To this day, we still use Bluehost when we need to create a website quickly. Some web hosting companies say that they charge $5/month, but then add another $5-10/month in mandatory charges at the very last minute in the checkout. We eliminated all remaining web hosts on our shortlist that had misleading pricing, or that didn’t allow you to get up and running at the price mentioned on their homepage or pricing page. We also believe that a good web host should have a no-hassle refund policy, so we eliminated any web hosts that didn’t offer a money-back guarantee. After doing this, only 16 web hosts remained on our shortlist. As you can see, the cost of hosting a website with these hosting companies for 3 years varies by almost two orders of magnitude from $106.20 to $3,564. Why? Service quality is one reason, but the main reason for the price difference is just in who these companies target as customers. Pagely, for instance, is aimed at big brands with big budgets. Bluehost, on the other hand, is aimed at small businesses and individuals wanting to launch a website quickly and without breaking the bank. Out of the web hosts that made our top ten, Bluehost had the most competitive pricing, starting at $2.95/month when you pay for three years up front (total: $106.20). Bluehost lets you upgrade or downgrade your plan with one-click, and allows you to cancel your account and receive a full refund at any time. While other web hosts may offer large discounts for paying several years upfront, most of them lock you into a contract that does not allow a refund after 30 days. Bluehost recognise that many of their users are beginners, so they offer very affordable hosting but also offer a no-hassle refund policy in case you change your mind. In 2008, Amazon announced that for every 100ms that they speed up their web hosting servers, they make an extra $1 million per day. Loading time is important – and nothing impacts page speed more than the web hosting company you choose. Using GTMetrix (a website speed testing tool), we measured the page load speed of an identical basic website that we hosted on a range of web hosting accounts that we created. For consistency, we tested the shared hosting plan (we’ll explain the differences between the types of hosting plans later). Typically, shared hosting is the lowest performance type of hosting, so we felt that if this was fast – the better plans would be even better. Page speed is based on loading the default WordPress theme. Tested with GTMetrix. Only 13 of the 16 web hosts on our short-list passed this speed test. At 0.59 seconds to load our basic test website, InMotion had the fastest page loading speed out of all of the web hosts we tested. This is likely due to the fact that InMotion uses state-of-the-art hardware (such as SSD storage) on all of their plans, giving them a speed advantage over some other web hosting companies that are still using older / slower hardware. All of the web hosts in our short-list at this point had at least 99.9% uptime in the past 12 months, as monitored by independent third-parties including our own server monitoring (via Pingdom). Data sources: BestHostRatings’ uptime study, Pingdom. Values have been rounded to two decimal places. You might be wondering – isn’t there a web host with 100% uptime? The answer is no. Due to unpredictable natural disasters, human error, and hardware faults, 100% uptime is a myth. Even Facebook, Amazon, and Google go down from time-to-time. While some web hosts “guarantee” 100% uptime, this usually means that they’ll refund you some money if their servers do go down. What we’re really looking for with uptime is consistency and recovery speed. Every web hosting company has the occasional outage, the difference is how long they last and how often they occur. For example, our Bluehost account has only had two outages in the past three years that lasted more than 20 minutes each. While Bluehost does have minor outages that last for a few seconds every now and again, their uptime is very good based on our reports. In my opinion, I would not worry about the difference between a web host offering 99.93% uptime and one with 99.95%. As long as you choose a reputable web host with uptime in this ballpark, you’ll be in safe hands. WP Engine may not be the cheapest web hosting company, but they sure know a thing about keeping WordPress sites running smoothly. Ironically, they’re one of the very few web hosting companies that don’t talk about ‘99.99% uptime guarantees’, and yet they seem to have one of the best uptime track records. Trusted by brands like Asana, Soundcloud, and Arizona State University, WP Engine has built a reputation for being the best WordPress hosting company by ensuring that their clients’ WordPress sites are always protected from the latest security loopholes – which if exploited would cause downtime. Starting at $29/month, they’re not for everyone – but if you need exceptional performance, uptime and security, they’re definitely worth considering. By 2020 the web hosting industry is expected to have a larger carbon footprint than the airline industry. GreenGeeks replace 3x the amount of energy consumed by their users, in addition to delivering all of the typical traits of a good web host (solid uptime, great service, and fast servers). All of their plans include daily backups, SSD storage, a free domain name, and 1-click installation of 150+ services. When you go to a website, you’re really just viewing a bunch of code that your Internet browser (like Chrome or Firefox) displays as a web page. This code is stored in files just like your Word documents and photos, and like all files, they need be stored somewhere. On your computer, you store your files on a hard drive. Similarly, website files also need to be stored on a hard drive of a computer that is connected to the Internet. When you type in a web address like ‘ventureharbour.com’, your Internet browser goes to the computer that is storing that website’s files and then serves them to you in the browser. This is why computers that store website files are called ‘servers’ – as they serve files. A web hosting company or ‘web host’ is a company that owns lots of these computers and leases them out to people like me and you. This means that we can put our website files on a computer, without having to go out and spends a lot of money on a server that needs to be maintained and managed. If you’re wondering whether you could just host your website on your own computer, the answer is yes – and some people do. The problem is that computers break. Hard drives fail, CPUs overheat, and then there are software issues. A web host takes care of all of this for you – often employing clever solutions so that your website is automatically copied onto a working server if and when your current server breaks. If you built and ran your own server, you’d have to take care of all of this yourself. And after all, with web hosting now costing as little as $2.95/month and including 24/7 support – it has become a no-brainer to use a web hosting company. So, if a web host is really just a computer to host your files on, what’s the difference between all of the plans offered by web hosting companies? What type of hosting is right for me? Shared, VPS, dedicated or WordPress hosting? If you’ve visited a few web hosting company websites you might be wondering what the different is between shared hosting, VPS (virtual private server) hosting, and the various other types out there. If it’s your first website, you’ll likely be looking for shared hosting which is the simplest and most affordable type of hosting. For example, Bluehost’s shared hosting plan starts at just $2.95/month. Shared hosting is the cheapest type of hosting, and is suitable for beginners, hobby websites, or testing new ideas. Why is shared hosting so affordable? With shared hosting, your website is stored on a server with hundreds of other websites. It’s like living in a shared house – you have one house that is shared between several people. Everyone pays a bit less than living in their own house because the rent is shared between lots of people. If your website receives less than 5,000 visits per month (you can track this using a free web analytics tool like Google Analytics), shared hosting is ideal. When your website starts to grow, however, you might notice that the server is too slow for the amount of traffic you have. When you reach this point, you can just email your web host and ask them to move you to a more powerful server. There is usually no cost for doing this – you just pay the price of the new plan instead. A VPS (virtual private server) gives you more speed and power than shared hosting, but without the cost of leasing your own server. This is what we use at Venture Harbour to run sites like this one. VPS hosting is like living in an apartment block. You’re still sharing a building with other people but you have your own private space with extra security and autonomy to make changes. With VPS hosting, you’re likely to be sharing the server with tens of websites rather than hundreds or thousands of websites. Because of this, your website is allocated a larger percentage of the server’s power, memory, and storage space. One of my favorite things about using a VPS is that you can store multiple websites on one VPS server. Our Bluehost VPS currently hosts five websites – including ‘staging sites’ that we use for testing, as well as sites like Marketing Automation Insider, and Qosy. Having the one account makes it easier for us to manage lots of websites, without having individual hosting accounts for each of our websites. If you’re looking for something that’s faster, more secure, and gives you more flexibility than shared hosting, a VPS might be right for you. Most VPS hosting packages start around $30/month. Dedicated hosting is where you lease your own server that hosts nothing but your website. As such, you get to control and customise the server extensively to meet your needs. You can even decide which hardware you’d like installed on your server. The downside of dedicated hosting is that you need technical skills, and to know how to configure and maintain a server. Unlike VPS or shared hosting, if something goes wrong on your dedicated server – it’s likely going to be up to you to fix it. The main advantage is that you’ll have no neighbours (no other websites hosted on your server). It’s the equivalent of renting your own detached house in the countryside. It’s typically more expensive and harder to maintain, but it gives you the most privacy and security. As such, I’d only recommend choosing dedicated hosting if you know what you’re doing, or if data privacy and hardware configuration is important to you. If these don’t matter to you, but you want something extremely powerful – cloud hosting might be more suitable. The problem with the types of hosting above is that the number of visitors your website can comfortably handle is limited by your server’s hardware. In other words, they only scale to a certain point. Cloud hosting is a bit like a gym membership, in that you pay a monthly fee that gives you unlimited access. Some months you might go twice a day, whereas other months you might not go at all. Cloud hosting is the same as VPS hosting, but instead of your website sitting on one VPS server, your website can automatically be scaled onto tens or hundreds of VPS servers if and when your site needs a lot more power. This might happen if, for example, you get featured in a major publication that sends millions of visitors to your site on the same day. The site then ‘downscales’ once your traffic goes back to normal. Cloud hosting is only suitable for websites that receive more than 100,000 visits per month and need the ability to scale upwards and downwards on a daily basis. We use cloud hosting for Leadformly – a ‘software as a service’ (SaaS) tool we created to make it easy to build lead generation forms. We chose cloud hosting for Leadformly because on some days we could have hundreds of users logging in and building complex forms, while on other days it could be thousands. Cloud hosting means that we don’t need to worry about the tool slowing down during peak usage times. Like mobile phone contracts, you can either pay for cloud hosting on a pay-as-you-go basis or on a flat-fee basis. Amazon Web Services (AWS) is one of the most popular PAYG cloud hosting solutions, which allows you to pay for the number of seconds that you run a web host. Note: This is only suitable for very technical users. If you’re not an experienced developer yourself or don’t have access to an IT/development team, I would not recommend this. WordPress is a free content management system (CMS) that allows website owners like you and I to easily add, edit or delete content without having to do any coding. It’s the most popular CMS and powers over 25% of all websites on the Internet. Due to its popularity, some web hosting companies now offer web hosting that is specifically optimised for WordPress sites. Most WordPress hosting plans are actually shared or VPS hosting plans that have specific software to make your WordPress site faster and more secure. Note: You do not need to use WordPress hosting to have WordPress. WordPress hosting is simply a type of shared / VPS hosting that is ‘optimised’ for WordPress, but it is not essential. There are even companies, such as WP Engine, that only host WordPress sites. In addition to offering servers that are optimised for running WordPress, these companies proactively look out for the latest WordPress security flaws and ensure that their customers’ websites are always protected against them. If you run a high-traffic blog that runs on WordPress, I’d recommend considering using WordPress hosting. Here are ten of the most commonly asked questions about web hosting. For a website to be accessible on the Internet it must be stored on a computer that is connected to the Internet. These computers are often called servers. Web hosting companies allow you to upload and store your website on a server for a fee. Web hosting can cost anywhere between $2.95 per month to $10,000s. The cost depends on how much storage you need, the performance of the server’s hardware, and level of security. A typical shared web hosting package should cost less than $15 per month. How much web hosting space do I need? A typical website uses around 500MB – 1GB of storage space. Most individual web pages are 1MB – 2MB in size, so a 500-page website would likely be around 500MB – 1GB. This does depends on how many images, videos, and pages the website uses. Does web hosting affect SEO? Yes. The web hosting company you choose does affect how your website ranks in the search engines. While not a direct ranking factor, your web hosting company impacts your website’s page speed and uptime, both of which will influence your website’s ability to rank in the search engines. Does web hosting include email? Most web hosting companies do offer email, allowing you to have an email address that uses your domain name, either as an optional add-on or as a part of a hosting package. There are a few web hosting companies that do not offer this, so it’s important to check this before purchasing a hosting plan. Does web hosting include a domain name? Most web hosting companies do include a free domain name when you sign up for a web hosting plan, but often only for a limited amount of time or when you purchase a certain plan. If a domain name is not included, you can still purchase it separately and use it with your chosen web hosting company. How do I change web hosting providers? Sign up for a new web hosting service. Upload a copy of your website onto your new web hosting server – this can sometimes be done using an automated migration plugin provided by your web host. Check that all pages on the copy of your website are identical to your current website. Once both the new and current versions of your website are identical, you must change your nameservers or DNS records to point to your new web hosting server. After 24-48 hours, your domain name should be point to your new web hosting service. Test that everything is working okay. You’re done! You may now cancel your old web hosting service. What web hosting should I use? You should use web hosting that meets your budget, needs, and performance requirements. If you are using WordPress you may want to consider a WordPress hosting company such as Bluehost or WP Engine. We have listed our recommendation of the 10 best web hosting companies above. Yes. All websites need web hosting in order to be accessible to people via the Internet. Web hosting services vary in price and quality, so the best web hosting for you will depend on your budget and requirements. Do I need web hosting for WordPress? Yes, you do need web hosting for WordPress if you are using the open source version of (WordPress.org). If you are using WordPress.com to build your website, web hosting is included in the price. We use two web hosting companies at Venture Harbour; Bluehost and WP Engine. Several years ago, we decided to migrate 12 of our websites to WP Engine. In this post, I’ll share why – and our experience so far, including the ups and downs. TLDR: WP Engine is an impressive web host. While they do have a few quirks that take getting used to, I’d recommend them if you run a WordPress site that gets a decent amount of traffic. I’ve previously written about migrating VentureHarbour.com to Media Temple. Annoying auto-updates – Media Temple regularly updated our WordPress files without telling us. While this sounds like a good thing, these updates occasionally broke our site. Their auto-updates also included useless plugins and themes that they were trying to promote/sell, causing our server to get bloated. Declining performance – When we started using Media Temple, our sites were lightening fast. Over time our server performance went downhill. I’m not sure if we were moved to lower-quality hardware or whether their servers just didn’t scale up properly, but we saw a significant drop in performance. Slow and buggy auto-migration – Media Temple claim to have a one-click migration service. Unfortunately, it took us over 4 weeks to migrate one site from Bluehost to Media Temple. It turned out that Media Temple’s auto-migration plugin would often skip files, resulting in incomplete migrations. After evaluating over 53 different web hosting companies for this guide, we were curious about WP Engine, who scored exceptionally well in a range of areas. Everything from uptime and server hardware quality to the average time it took their customer support to answer the phone was impressive. As we use WordPress for the majority of our sites, I decided to migrate VentureHarbour.com to WP Engine as an experiment. If after two weeks we were happy – we would gradually migrate all of our WordPress sites over to WP Engine. When I opened our WP Engine account, I decided to record a short video talking through my first impressions of their platform out loud. To see a quick walkthrough of WP Engine’s interface, as well as what it’s like when you first open your account with them, watch the video here. Since recording the video above, we’ve migrated 12 of our sites to WP Engine and monitored the performance of them for two months. Every web hosting company says that they offer WordPress hosting these days. But no one does it quite like WP Engine. WP Engine doesn’t let you install certain WordPress plugins. Why? Because they constantly monitoring the WordPress plugin marketplace to identify plugins that have security loopholes or that put a lot of strain on your database (causing slow loading). This is how WP Engine are able to guarantee that if your site ever gets hacked, they’ll fix it free of charge. They prevent the likelihood of it happening in the first place. In addition to this, WP Engine has built-in caching, a built-in CDN (content delivery network), automated daily backups, and much more – to prevent you having to run lots of WordPress plugins that would cause bloat. They do this in addition to using server hardware and software that is specifically optimised to run WordPress sites. The result? You can rest assured that your site will run fast, with good uptime, and without the risk of it being hacked. When we used Media Temple, I always thought their customer support was quite good. It was a bit annoying having to remember a PIN to call them, and they didn’t have live chat, but problems were generally solved quite swiftly. But WP Engine has since raised my expectations for support sky-high. When one of our sites was running a bit slower than expected, WP Engine’s support team moved our website to a brand-new higher-spec server free of charge. No downtime, no selling, and no effort on our part. They just got on with it. When a migration didn’t work out and I clumsily set up the DNS records incorrectly, they told me the exact changes to make, which solved the issue in minutes. I’ve never had to call up WP Engine’s phone support, as their live chat is so good. We’ve always got a response within less than 2 minutes from a skilled tech support person. This is what’s going to make it extremely hard to use any other web hosting company. After my experience with Media Temple’s “automated” migration tool, I was extremely sceptical about WP Engine’s automated migration plugin. But I gave it a shot. I was blown away; It was so easy I migrated four of our sites to WP Engine in about an hour and a half. When I told our CTO about the migrations, he didn’t believe me – so we migrated another site to WP Engine together. It took under 15 minutes. The first time does take a bit of getting used to, but their plugins just work. Even if you have files outside of the WordPress installation, it seems to (almost magically) copy them across. You can choose the location of your server. Staging sites – While other web hosting companies we’ve used have enabled staging sites (cloned versions of the website to test/build on), they can be time-consuming to set-up. WP Engine has a one-click clone button that creates a staging site. 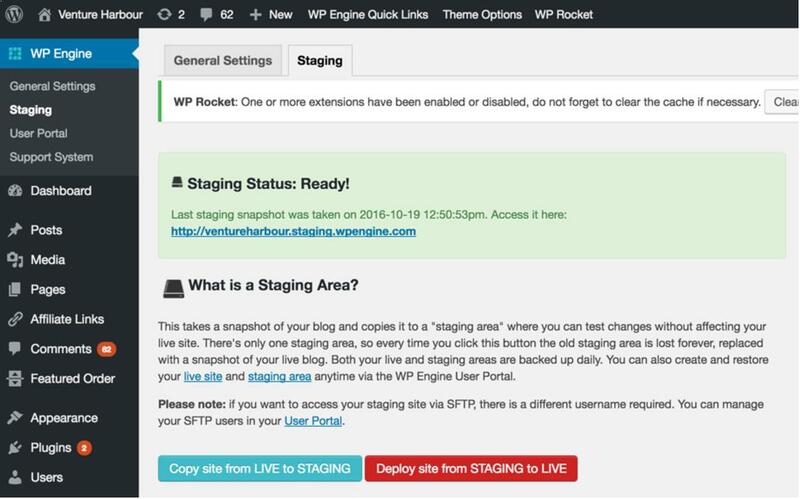 You can then deploy from staging to production in one click from your WordPress dashboard. Free SSL certificates – With WP Engine you can convert your site to https:// in seconds with a free SSL certificate. For a few of our sites, we actually decided to cancel our paid SSL certificates, as it was easier to just install a free WP Engine one. Automatic backups (done well) – Most web hosting companies offer daily backups, but there’s usually a catch. Either you can only restore the backups (but not download them to your computer), or the backup happens daily instead of after major updates. With WP Engine, you can download or restore backups. Backups are also taken daily AND before and after all major updates (e.g. updating your WordPress version). Scheduled page speed tests – Another unexpected nice touch is that WP Engine can run weekly or monthly page speed tests on any page you specify. This means you can diagnose when changes to your site cause it to run slower. Clever user & FTP management – One challenge we’ve had with other web hosting companies is having multiple developers sharing SFTP logins, or ending up with lots of unused FTP accounts. WP Engine allows you to set permissions for control panel access to prevent contractors being able to access sensitive areas like billing. They also allow you to create disposable SFTP logins, making it easy to give different logins to different developers that will expire. While WP Engine are by far the best overall web hosting company we’ve ever used, they’re not perfect. Below are some of the drawbacks and ‘doh!’ moments we’ve come across using their service. What makes WP Engine great is that they just do WordPress hosting. This can be frustrating. For example, WP Engine doesn’t offer email hosting. If you want to have an email address for your website, you’ll have to use a separate email host like Google Apps or Zoho Email. Want multiple (non-WordPress) databases? Nope. If you run a site that has a non-WordPress component (e.g. a software application), you probably won’t be able to run the software part of it on WP Engine (which means you’ll need a separate hosting service like AWS to run it). For me, this is the biggest drawback with WP Engine. That said, it’s a necessary compromise that (for us) was worth it – as it’s what allows WP Engine to offer such a high-quality WordPress hosting service. At first, I was really impressed that WP Engine had a built-in content delivery network. As we have a paid account with CloudFlare, I was looking forward to moving our CDN under the same roof as our hosting with WP Engine. But it didn’t happen. We still use Cloudflare on all of our sites. WP Engine uses NetDNA as their built-in CDN. It’s not as fast as Cloudflare, it doesn’t provide the same level of DDoS protection, and it seems a bit buggy. When we turned on the CDN the first time, it was ‘on’ in our control panel but seemed to make no difference to our page speed. After contacting support it turned out that it was not actually on. Thankfully, their support team rectified this straight away by turning it on manually. What happened next was that all of our site’s resources were loaded from a .netdna.com subdomain. This was a bit annoying, as we’d worked hard to reduce the number of DNS lookups our site was making – so we had to manually change all of our resources to be loaded from .ventureharbour.com instead. In the end, we just used Cloudflare. Our account allows us to run 25 WordPress sites with a total allowance of 400,000 visits per month. While this seems like a lot, that’s an average of 16,000 visits per site per month. Currently, our sites use about a quarter of this allowance. While understandable, it does make me a little bit nervous that we might be charged overage fees if we suddenly received a spike in traffic. One positive aspect of this is that WP Engine does not bill you for any bots or non-human visits. As you can see from the screenshot above, this is quite a significant chunk of traffic (over 10% of our visits were non-billable). Before we migrated VentureHarbour.com from Media Temple to WP Engine, I recorded our page speed performance, so that we could benchmark whether the migration had improved our performance or not. 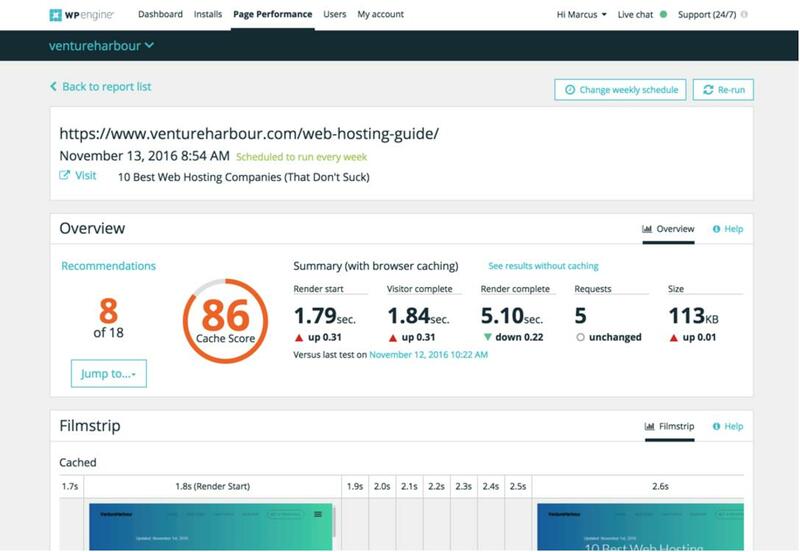 Prior to moving to WP Engine, our web hosting guide took 1.32s to load and had a page performance grade of 90, which is pretty decent. Immediately after the migration, the same page was now taking 1.22s to load. While not a staggering improvement, it is still a 7.5% improvement on an already very good page speed. If you’re wondering about the variation in page size, this was due to the hiccup with WP Engine’s content delivery network that I mentioned earlier. In other words, the Media Temple score benefited from a Cloudflare CDN, while the bottom score did not have a working CDN. Summary: If we went back two months, would we still migrate our sites to WP Engine? In the past, I’ve often had buyer’s remorse when choosing a web hosting company. Usually, I come across another web hosting company that offers something better for the same or a lower cost, or a friend tells me an amazing story about a certain web host. I haven’t had any remorse with WP Engine. In fact, I’m *that* friend that’s been shouting about WP Engine from the proverbial treetops. While WP Engine is certainly not the cheapest option out there, they’re definitely one of the most cost-effective when you take into account the value of the security and performance features that they offer as standard. So who would I recommend WP Engine to – and more importantly, who wouldn’t I recommend it to? I would recommend WP Engine if: You have a WordPress site (or collection of sites) that receive decent traffic (more than 10,000 visits / month) and that you critically need to keep online and not get hacked. I would not recommend WP Engine if: You’re a beginner looking to host a low-traffic / side-project website (it’s probably overkill for that – save your money and use Bluehost instead). Obviously, if you’re not using WordPress this isn’t going to be right for you. I hope this evaluation has been useful to you. If you have experience with WP Engine, I’d love to hear your thoughts in the comments below – otherwise, if you want to get started with them you can do so by going to https://wpengine.com. Update: WP Engine have kindly offered a 20% discount to Venture Harbour readers on their first month if you go through this link. You can also get two months free by choosing an annual plan. For full disclosure, we do get paid a commission – but this comes out of WP Engine’s pocket and not yours. Since 2013, we’ve used a Bluehost VPS that we pay $40/month for to host a large number of smaller websites that we own. So, what made us choose Bluehost? With Bluehost, you can run a website for less than the cost of a cup of coffee each month. This has saved us hundreds of dollars every year in hosting fees. While Bluehost is cheap, they do not compromise on the quality of their service. Granted, they’re not the best, but they’re definitely the best web hosting company in the category of budget web hosts. Bluehost was one of the first web hosts I used when I started building websites. Unlike the more advanced web hosting companies, Bluehost keeps everything really simple. With one-click installations of WordPress and an intuitive control panel, it’s built with beginners in mind. Many cheaper web hosting companies I’ve used get you started on a low price and then sell different features to you every five minutes. Bluehost isn’t like this. In fact, it’s quite impressive just how flexible Bluehost is given how affordable their service is. You can add unlimited email addresses and FTP users, install SSL certificates, and even configure backups – all without paying a penny extra. While our experience with Bluehost has been extremely positive over the past 3-4 years, they’re not perfect. In fact, there’s a good reason why we only use them for our smaller sites. Bluehost’s servers are fast and stable up until a certain point. When our websites began to exceed 30,000 visits per month, we noticed more downtime and a decrease in page loading speed. Unless you’re willing to pay for Bluehost’s dedicated servers, their service isn’t built for high-traffic sites. While Bluehost’s support tends to be very responsive and helpful, I have had a few instances where I’ve had to wait on hold for over twenty minutes due to calling in at peak times. While understandable, this isn’t an issue that I’ve faced with WP Engine. Conclusion: Ready to bring your idea to life? I recently heard a story about a man who couldn’t decide which smartphone to buy. After days of weighing up the pros and cons of various models, he decided to go with the one that had the highest screen resolution. The phone he’d chosen was $100 more than the rest, but it had 577 PPI (pixels per inch) instead of just 440 PPI. But it turns out the human eye can only see a maximum of 300 PPI. The lesson from this story is that stats and specs, while useful, can distract us from what really matters. The phone manufacturers know this, so they continue to push up their phone specs even when they have no real benefit to us. In our instance, the goal is to get a website live with a web hosting company that is not going to cause any major problems. I am confident that, after all of our research and testing, you could pick any of the web hosting companies mentioned in this guide and achieve that goal. And on that note, it’s over to you now. If you still have any unanswered questions, post them in the comments below and I will respond to them as quickly as possible. Otherwise, I encourage you to choose a web host and get cracking. I really hope this guide was helpful. If you did find it useful, I’d really appreciate a share on your social network of choice. Seriously its an amazing guide about web hosting. Web hosting is an integral part of every major business indeed. Business owners should consider all these factors before choosing web hosting services. How much space you will need? Should be the question in mind. How many email–addresses and domains you have required is also essential to determine. Security level is another important factor that should be considered by one. Thanks Andy, glad you found the guide useful. Agree – there’s a lot to consider and it’s easy to get stung with a poor hosting company. Fortunately, a lot of the hosts are getting better and picking up their game, but not quite enough! Advise Webhosting is fast, reliable & affordable,(Windows or Linux) 24/7 SUPPORT! I had shared hosting, now I host my websites on a vps with rosehosting.com and I can say that compared to shared hosting, vps hosting is much better in terms of reliability and performance. Hi Rebekah, you usually see quite a big improvement in quality when moving from shared to VPS. I moved a bunch of sites to a Bluehost & MediaTemple VPS earlier this year and found a huge improvement in site speed. It’s not too surprising that you get what you pay for with hosting! Great reviews on web hosting. I am new to this and appreciate the simple and clear comparisons and the advice for beginners like myself. I choose Bluehost shared account and look forward to learning and testing out some ideas. No problem, Marc. Glad the guide was helpful. Bluehost are great for the price – they get quite a bad wrap from the developer community, but for less than $5/month they’re hard to beat! Its a wonderful post. Thanks for sharing such a great information. Thanks for your wonderful article. The bluehost price is rather cheap, and should only be used when you want to build a medium site with medium visitor daily. Very nice write up. Finding a good and reliable web host is not as easy as it seems. There are several good hosts on your list, but I would like to add Rose Hosting. They have great support and their prices are affordable. I have enjoyed your article. Thanks. Really Great Comparison and Good Tips for Every kind of Hosting Needs. Really appreciate that. Haven’t tried MediaTemple. You got that into my head. Will surely try it. Arguably, one of the best reviews I have read about web hosting. The things explained in this article are very important to consider before zeroing in on the host for your website. Great post. Thanks for sharing such useful information. What a great article. Thanks! I am starting a WP blog. I will obviously have very little traffic in the beginning but am hoping to have lots of traffic as I get on. Should I optimistically start with VPS rather than shared? How easy is it to upgrade? And do you have to see out your contract on shared before you can upgrade to VPS- provided it is with the same host does it matter? Can’t pick between Blue Host or Media Temple. Am worried that if I suddenly have a viral post and a big upsurge in page visits I will get kicked off or turn visitors off by having slow speeds etc. Please help, thanks so much in advance! To be totally honest, it depends on how much traffic you expect and how many sites you build. At VH we have a basic VPS with Bluehost which we put our new / small sites on. At $30/month this works out very cost effective as we have around 6-7 sites one there. When a site begins to grow we migrate it over to our MediaTemple server, which is significantly faster and has better performance (but also more expensive per site). Migrating is relatively easy, however you would need to finish your contract with the old host if it’s just for one website. A good solution would be to use a shared host like Bluehost, and then use a service like Cloudflare (free). Cloudflare effectively copies your website files and hosts them on multiple servers around the world to improve page speed and reduce downtime / poor performance when your receive a traffic surge. When you start to see a lot of traffic spikes you can then migrate over to a better VPS / dedicated server. Thanks Marcus, for this wonderful guide. your thoughts defiantly gives a right path to beginners who’s looking for the right web host for their business. Really appreciate. I love this guide. As a beginner, it is quite helpful for me thanks for this wonderful post. Just as an addon: Media Temple does not (no longer?) offer unlimited bandwidth, and they do charge overage fees. Thanks for letting me know – I’ve just updated the comparison table and the paragraph about bandwidth / overage to reflect this. Thank you Marcus for this great article. I use to host all my clients in Bluehost but it became a huge problem. Now I went for a dedicated server where all my clients are hosted and it has been a very good move. A 5 years slide with no issues a fantastic support and a troubleless adventure. Thank you very much, Marcus for this awesome guide, I have been looking for such a guide for a while. What VPS hosting companies do you recommend? I tried just host shared hosting and it was terrible performance wise and speed. If you’re running WordPress you can’t go wrong with WPEngine’s VPS service. MediaTemple are also a good option – although I don’t recommend their WordPress VPS hosting as they seem to upload all of their own themes/plugins onto your server. We’ve had several instances where our sites have broken due to MediaTemple deciding to update our WordPress files without telling us. Do you have experience on the namecheap & ipages share hosting? because i just start to learning for SEO, and i need a platform to run & test the result. I’ve never used iPage, but I believe they’re owned by EIG (the same company that owns Hostgator and Bluehost). We’ve used Bluehost for a lot of Venture Harbour sites and have had a good experience. I have spent days trawling the internet to find clear and unbiased web hosting advice for UK businesses. Your article is the light at the end of this long and repetitive tunnel – thank you so much! To be completely honest, I often use a separate service for mail (SendinBlue & ActiveCampaign). However, we I have a few email addresses with Bluehost and Dreamhost, both of which seem to work well. I’ve never ran into any problems with them. Thanks for a very enlightening post. We are a small indie music publisher with a lot of storage of music files with Dreamhost and we are trying to look at the best way to get get rid of the buffering when tracks are played. Our clients are in Australia & New Zealand so do we look for a local host or would a dedicated server at Dreamhost with CDN be the best option. I would definitely recommend a dedicated server + CDN approach as it’ll be far superior, providing the CDN has a local data center. I believe Cloudflare have ones in Sydney and Singapore, which should do the trick. Thank you for sharing your findings with the hosting companies. I took your advice and signed up for these web hosting. My site is working smoother. I am happy with this move for now. That’s great news! Thanks for sharing Geny. 3. The host should have multiple data centers so all my websites could have different IPs as we serve different regions. Your suggestion will be much appreciated. I have written to wpengine.com as well. Thank you! It sounds like your best options are InMotion, WP Engine, or perhaps even Amazon AWS. InMotion offer managed VPS / dedicated servers and have two data centers (east coast / west coast), so I’m not sure this would suffice for having different IP addresses. I have a feeling WP Engine has the same issue. Amazon AWS have about 15 data centers I believe, but AWS has a notoriously difficult learning curve. One ‘hack’ to get the benefit of AWS would be to use something like Pagely, which is essentially just Amazon AWS with a more intuitive frontend. Hey, Marcus, thanks for your review. After reading it, I decided to ask for your advice. A couple of months ago I signed up with Hostinger free plan and tested their services, the UI is friendly, customer support is professional, in any case, am satisfied so far. Yet, my website started to get traffic and I would get some server errors, so I believe I need to start using a paid plan, upgrading is the easiest way to go, still just wanted to double-check with an expert, maybe you’ve tried their services and have some insights to share? Thank you in advance. I actually met Hostinger’s CEO (Arnas) earlier this year at a conference – great guy and very ambitious with what he’s doing at Hostinger. Coincidentally, they were the very first web hosting company that I used when I started out (14-15 years ago). They’re certainly not a bad option, but I haven’t used them for over 10 years. For the price, I would personally steer towards something like Bluehost or InMotion. I was reading your review (and read your blog from time-to-time), this comment really caught my atention, since I also am hosting with them now and they are my first hosting provider! So cool that you started with them too! Don’t know what the service was like before, but now it’s pretty good. Especially when they added the live chat feature from the cPanel. Great guide Marcus. I’m using SiteGround for the last couple of years and the service has been amazing so far, whether it is about the server speed or support, the Guys rock. Nice! I’ve heard nothing but good things about Siteground. Have you used any other web hosts that you found Siteground to be better than? Hello, thank you for this amazing share! Why is HostGator not included here? Did they fail a part of your test? Hi Austin – yes HostGator didn’t do too well in our test. Their page loading times in particular were quite poor in comparison to the web hosts that made it into the top 10. Would love an explaination from you! Thanks for sharing this information. Most of the hosting providers above use the Linux platform. As far as I know, only Liquidweb offers Windows as a hosting platform, but they are more focused on dedicated servers. I have experience with GoDaddy’s Windows platform but they are not good enough. They don’t support full trust and their technical support are not knowledgeable enough in asp.net. Hey Marcus, It’s the best guide I have ever seen so far. Especially, I loved the way you distinguish your recommendations for Small Businesses/ Blogs/ Portfolios and for High-traffic Sites. Few years back, I had been using one of the top 4 web hosts you mentioned here, and they were excellent for years. Then out of nowhere EIG came into picture, and it ruined everything from support to server performance. Another thing, if you see the prices of the top 4 web hosts, you will notice that most of the plans have approximately the same price. So, IMHO price should not be the concern while choosing a web host. I would choose a web host on the basis of availability and quality of support. Just wanted to say – fantastic article. Clear, to the point and states things “as they are”. Shared on twitter. Thank you for sharing this wonderful article. It’s really informative and helpful. I have been a customer of BlueHost for a year now and I must say, it truly is one of the best website hosts out there, if not the best. Support is good, pages load pretty fast and uptime is good, solidifying its status as one of the best website hosts. I was thinking of hosting my domains on a new website just to give it a try and was looking at different providers to compare, but what I learned from my research is that BlueHost is unbeatable, and it’s listed as one of the best website hosts on many review sites. Thanks for this detailed guide about web hosting it’s quite helpful and informative. Thanks for sharing useful stuff. Thanks for this amazing guide to web hosting. I have spent many hours researching web hosts on line and this is BY FAR the best, most informative and most comprehensive guide I have found. Thanks!